Pindasana is a very good posture to do after a forward bend such as Duttanasana or Dog. It can also feel very good for your back after doing a back bend. Benefits: Lengthens the spine and promotes relaxation in the body. Increases flexibility in the hips. Gives more space to the top of the ankles. Contraindications: If you have knee problems, go into this posture very slowly and discontinue if you experience any discomfort. You could try placing a cushion between the pelvis and the feet to lessen pressure on the knee joint. This might also be useful to do if you have varicose veins. If it’s sore at the front of the ankles, place a rolled up blanket or towel underneath them. 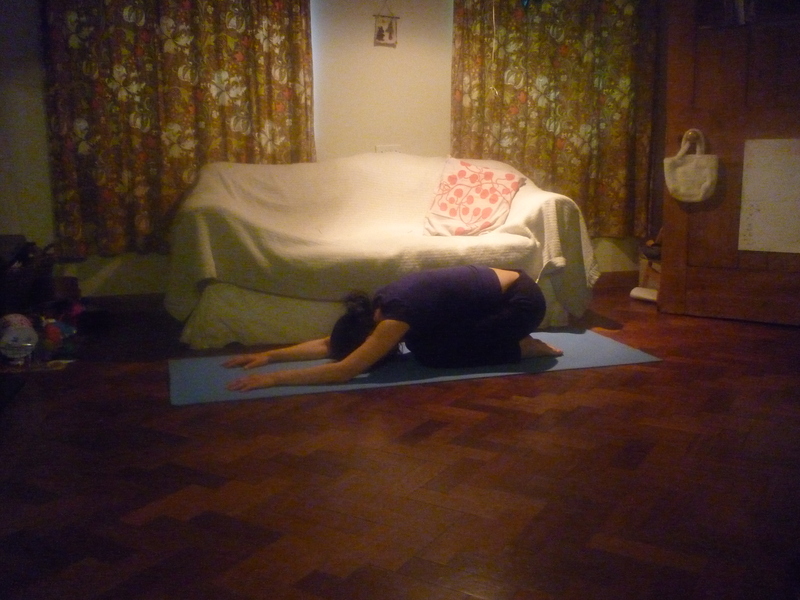 Practice: Come into a kneeling position and gently fold the upper body forwards over the knees. You can either rest the forehead – on your folded forearms – a cushion or two – or on the floor – if it feels comfortable. Give into gravity… Relax…Feel the back widening each time you breathe in. When you breathe out – the spine lengthens. When you feel ready to come out – walk your hands towards your knees to bring the upper body up and then lengthen the back of each leg out – toes on the ground, with the heel lengthening away. Take a journey around your body and see if there is anything still holding. If there is then imagine you are breathing into it. Visualise the area softening and releasing. When you are ready, next time you breathe out engage your thigh muscles. Allow the legs to become heavier and lengthen the tailbone away. As the upper body becomes lighter, ground the hands and allow your arms to push you up. Keep the elbows a little bent – so the arms don’t lock and become stiff . Keeping the arms bent will have the added benefit of helping them to strengthen. Be aware of keeping the front of the chest and shoulders, wide and free. Keep length at the back of your neck by allowing the chin be lower (rather than higher). BENEFITS: Lengthens the spine. Relaxes the body, mind and spirit. Beneficial for the many systems of the body – especially the immune system. Relieves stress. CONTRAINDICATIONS: This is one of the safest yoga postures you can do, but as with all postures of the week, only practice if it feels comfortable… Often late in pregnancy lying on your back can make you breathless. This is because the heaviness of the uterus can compress a large blood vessal (the vena cava) when supine. This will lessen the blood flow to the heart which will cause a drop in blood pressure and decrease the amount of blood getting to your baby. You will feel the discomfort almost immediately if it isn’t going to be a good posture for you or your baby. PRACTICE: Savasana can be done at any time – but is often practiced briefly at the beginning of some yoga classes and usually always at the end of a session for between 5 – 10 minutes. 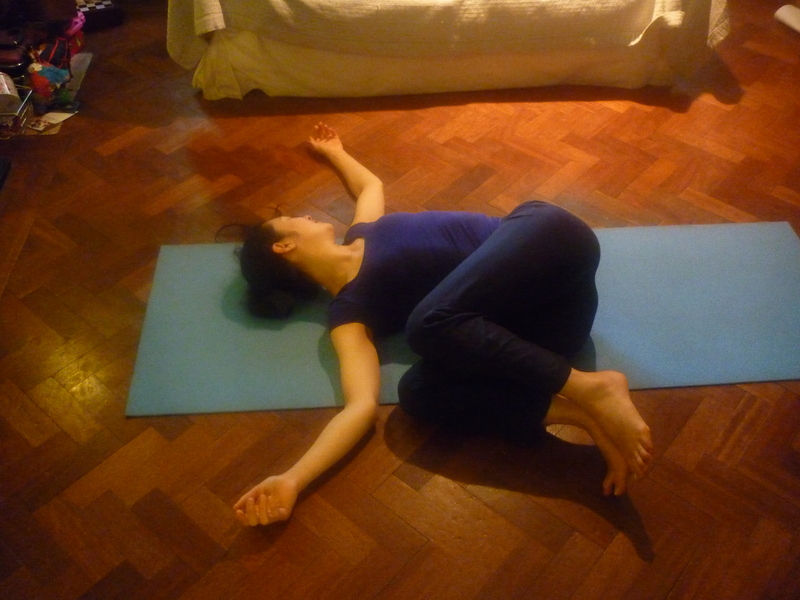 Lie on your back and gently hug your knees towards you. Have an awareness of your breathing and then gently let your knees fall away from you as you breathe out. Place the feet on the ground about shoulder width apart. 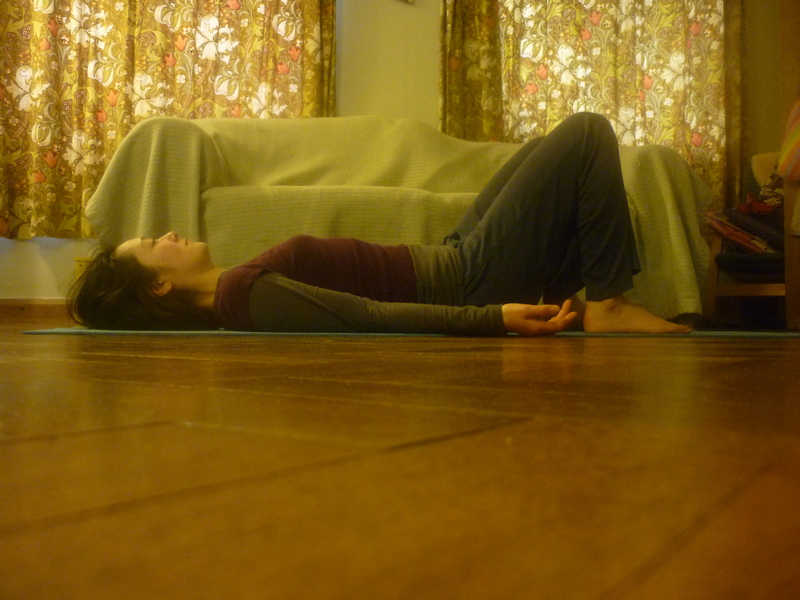 Allow the joints to be quiet…and a softness to flow over you – an easiness, a release, a relaxation…. Breathe… and have an awareness of the spine gently lengthening each time you breathe out. When you are ready to finish, slowly wake the body up and roll over onto your side. Stay here for at least half a minute, to allow your body to adjust before coming upright. When you are ready to sit up – use your hands to help you get up. This will protect your abdominal muscles and keep your spine nice and long.